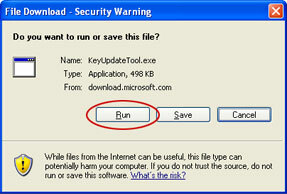 There is already a lot of product keys and serials utilities that allow you to change product key or CD key of Windows XP to another product key, in the case you’re bought another genuine and legit license, upgraded, lost the original serials, etc, or volume license key (VLK) if you or your company just switch to volume licensing arrangement. Microsoft has also provided its own tool to change Windows Product Key, which supposedly to be most reliable, risk-free and won’t mess up your system. The main purpose is to allow customers who purchased Get Genuine Kit to change their product key easily to OEM product key enclosed in certificate of authenticity (COA) label. According to Windows Product Key Update Tool instructions, Windows Product Key Update Tool will make changes to your Windows installation to update your product key. In addition, the product key update tool will scan a number of key Windows files to determine if they have been tampered with. In other words, the Update Tool actually perform a Genuine Windows Advantage validation on your system, and the information will be sent back to Microsoft, together with the file tampering scan results. 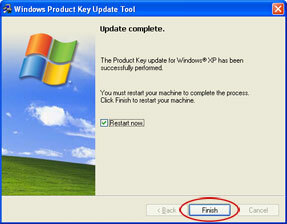 Download Windows Product Key Update Tool (KeyUpdateTool.exe) from Microsoft. Enter the product key found on your COA where requested, and then click Next to begin the update. Once the update is complete, click Finish to restart your computer. When your computer restarts, your computer’s product key will match the COA product key. If this tool fails to change your product key to match your COA, contact Microsoft Support. 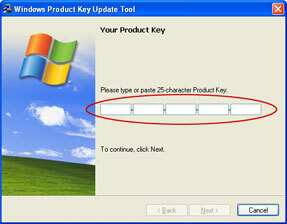 After updating your product key you will be required to activate Windows. Once Windows is activated, you can verify that your copy of Windows is genuine by going to http://www.Microsoft.com/genuine to validate Windows.